Digital Microsystems, Inc. was founded by John Torode, a computer science professor at the University of California at Berkeley. John Torode previously built a computer with a friend called Gary Kildall, the 'father' of the CP/M operating system. From 1979 to 1986. Digital Microsystems designed and manufactured microcomputer-based subsystems, computers, and one of the first microprocessor-based local area networks called HiNet. Originally based in Oakland, CA, DMS was sold to a British firm and grew to more than 200 employees worldwide with a sister company in England. Also called "Fox" the DMS-3/F was a CP/M based system. It could be used as a stand-alone system or as a network station able to emulate any video terminal. 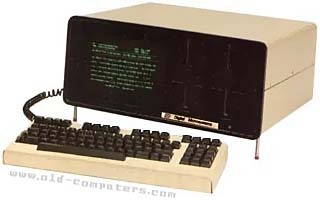 Digital Microsystems advertised that with its 9" diagonal screen, the Fox had triple the capacity of the most popular portable of that time, the Osborne 1. The system was sold with the HiNet local area network and four RS-232 serial ports allowing the professional user to connect its computer anywhere the business required for about the cost of a good typewriter. A 15 MB hard disk version called DMS-15 was launched in early 1983. To note the lovely gilded 60's fashioned feet with red rubber tips. see more Digital Micro Systems DMS-3/F Ebay auctions !